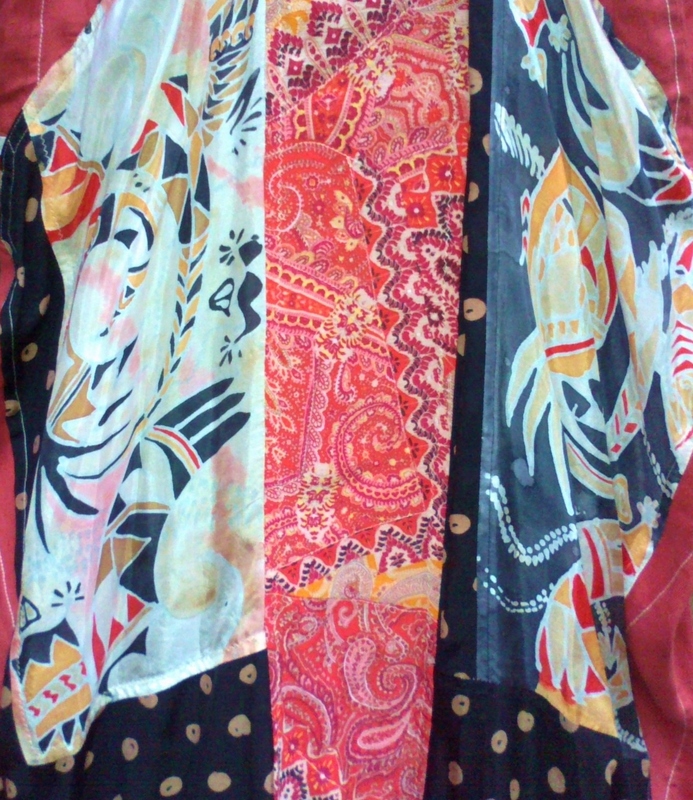 hand made – Unique Hand-made Patchwork DRESSES JACKETS SKIRTS KIMONOS. Name ‘Tasmanian Blues’ is derived from Tasmanian origin of the eucalyptus bark (found in Hillier Gardens, Hampshire), used to create a dyebath. Silk collar and patches on garment are hand dyed (Habotai Silk 10) which took the dye bath so well – just soaking for an hour. Bark was previously steeped 24hrs then boiled, simmered for 2 hours, before removing from heat and adding silk. A very deep gold was produced with the eucalyptus bark dye, which shines incredibly richly in sunshine. Lace pieces were left in the dyebath overnight and even though mixed fibres, took on a gold tone. 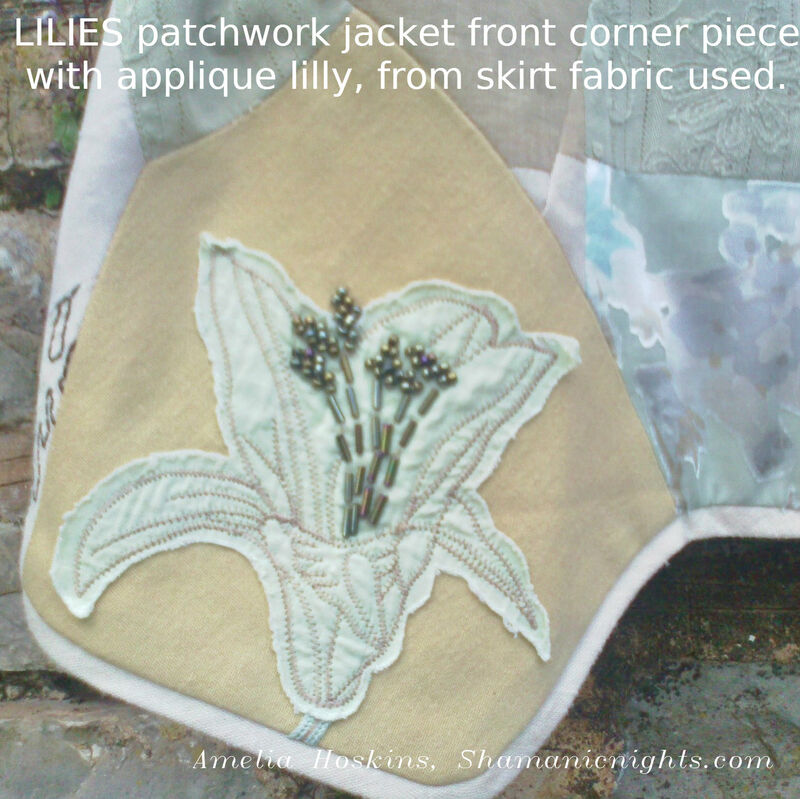 Seed design applique motifs uses the lace dyed with eucalyptus bark. Gold dyed Habotai silk was painted on with Kniazef steam fixed dyes. The gold dye was so strong, that painted dye colours were hard to see, and needed redoing. Even specialised bleach for silk dyes did not work, so well is the eucalyptus dye fixed! Left piece, modified with iron afterwards. Right piece original dye bath only. Original dyestuff is bright gold in sunlight, but darker indoors. The darker gold piece is modified afterwords with iron sulphate (rusty nail liquid). Bottom right shows lace pieces dyed in cold dyebath overnight. I chose the blues to go with the gold silk, because 3 of the prints have gold areas with blues. Blue and gold are a classic mix, setting off one against the other. Front buttoning strip features Chinese style print of Phoenix bird (right side) and tail of dragon (left side) which looks attractive as a focal point. Two fabric prints have animalistic feel: the leopard or cheetah in blue/grey/black, and the navy blue/white ‘pheasant’ feather print. The blue lace was the right colour to add in. The light blue with text also has navy and some brown which blends in. By putting a variety of fabrics together, a new design idea comes alive. Phoenix and seeds could be a new theme. Using the eucalyptus dyed lace, emulated the texture of dried seed pods. 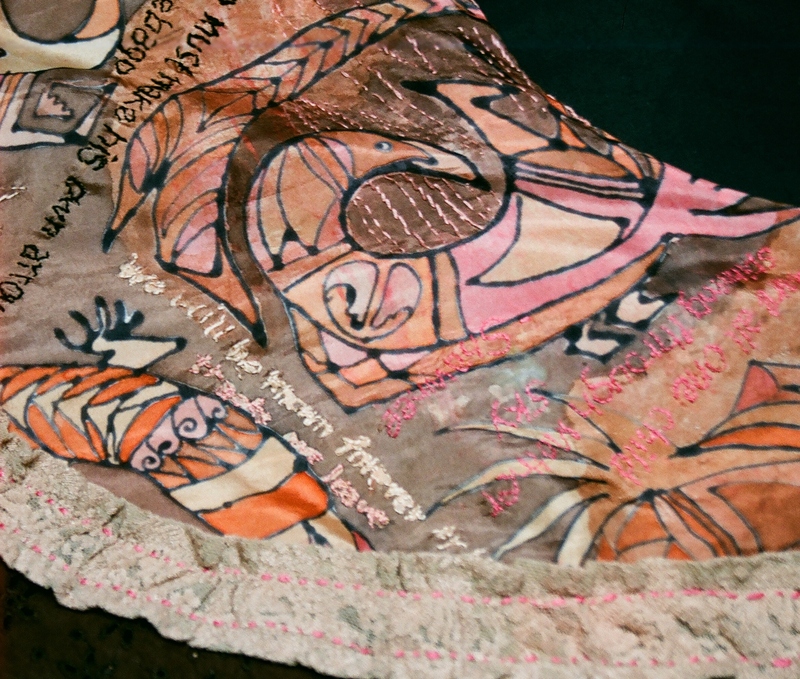 Centre seed capsule part (in shadow from photo/drawing) is shown in dark gold dyed silk remnant on right-side garment, and left-side garment shows a lighter silk, bundle dyed from various seeds and dried flowers. 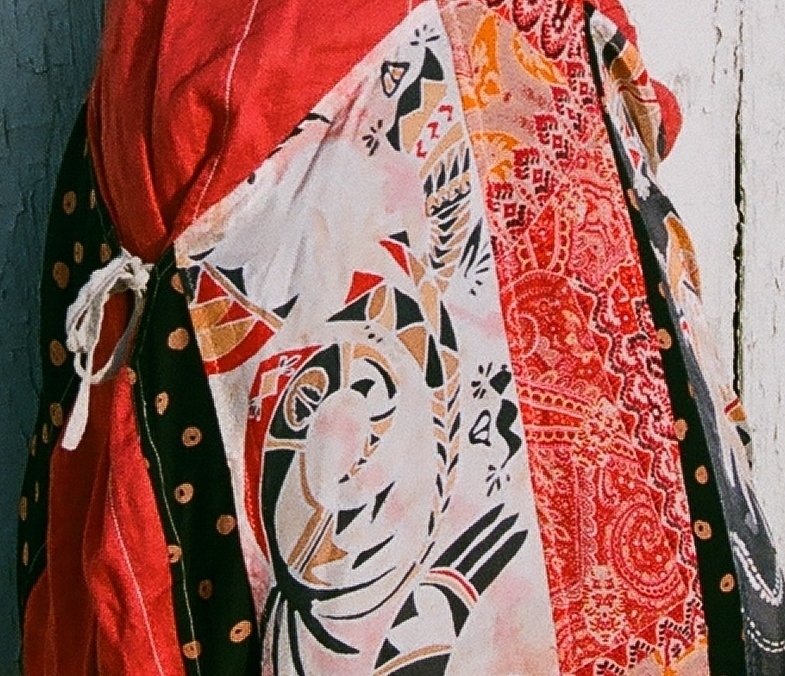 Garment started by using a polyester dress as LINING. I kept the cross-over ‘V’ neckline and fitted my fabrics to it. NOTE: its useful to have neckline and shoulders of a lining garment to start off with. 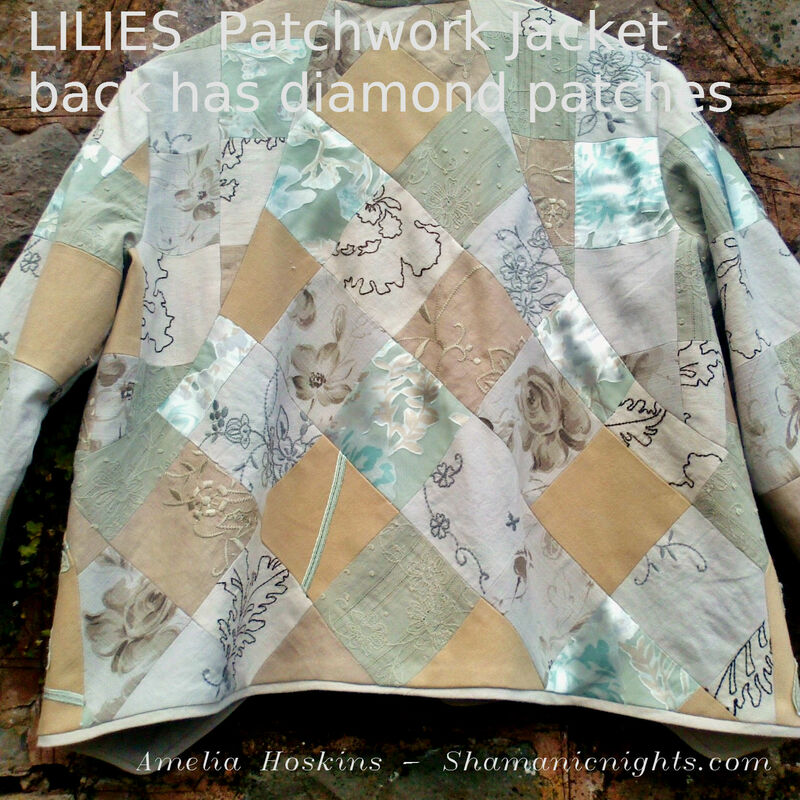 Once patchwork is attached to that, patchwork can simply continue down to hem. Its very useful to use a bodice top from another garment as lining to fit sleeves to. I often make an under bust, high waistline seam below the length of an upper patched piece, darting under bust; also optionally at back for better fit. The lining dress only has short sleeves, so I used other polyester fabrics to lengthen them in patchwork. 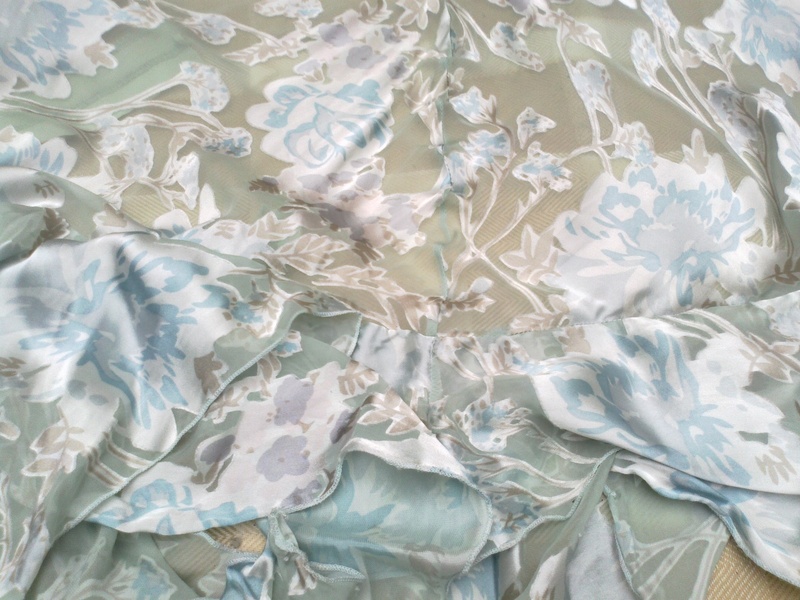 Outside sleeve fabrics are viscose floral print and others, seen in making photos. Last four photos show cuff addition to lengthen sleeve and give print interest. black fused interfacing ironed on. Fold extension over to show other fabric as an edge border contrast. Fold down outer onto lining. Pin cuff extension to outer sleeve patches. Machine or hand stitch down. To give a fuller underarm, similar to kimonos; after inserting sleeves, I left underarm and side seams open, and cut strips for underarm gusset, using viscose fabric outer and navy lace inner: an elongated triangle about 4 inches to a point from underarm centre into sleeve length. (the lining dress was small size, so these inserts also enlarged fit up to 38″ bust.) Darts can be seen at front and back of bodice sections. Back neck facing and simple front facing cut to fit dress front neckline. A curved frill piece was used from the original lining dress to create a fit, which curves around back neck and fits to front edge of ‘V’ neckline. Cutting adjustments made to allow a shape that would extend the curve from centre back neck (left side photo 1.) continuing around to fit to dress front V neckline, and produce a simple fold back collar only at front. 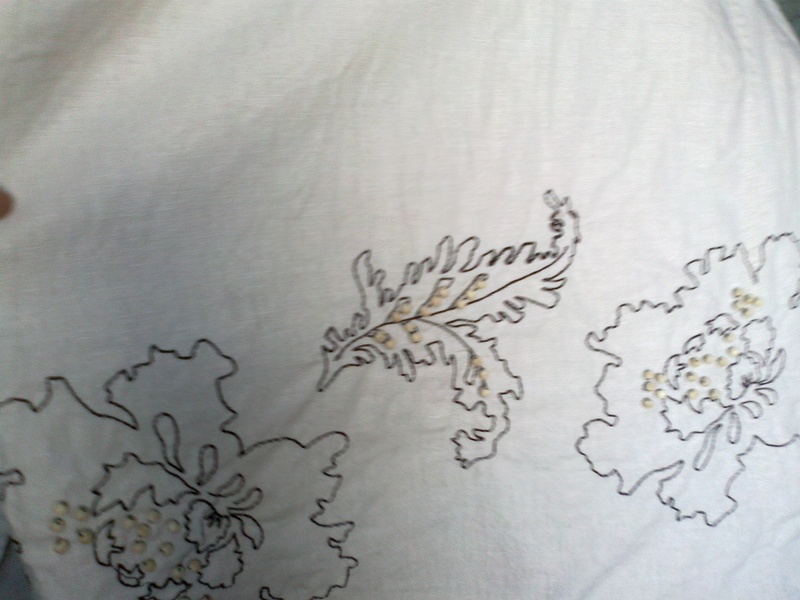 Once the under-fabric was established, an identical shape was cut in white cotton, to use as copy pattern for upper fabric patchwork, (which incorporates the eucalyptus dyed silk). Photo 2. ‘Collar/facing was firmed a little with fine fused black interlining. Once upper bodice is completed (with or without sleeves), the lower skirt part of kimono dress is made by cutting rectangles and joining until there is enough to fit around the high waistline. This is the stage to consider which colours to juxtapose in lower garment. You may save some special pieces to show at front. Symmetry is a good idea: working from centre, to sides, repeating colour/shades similarly on either side. Start at the centre on the back, and work to the sides, adding patches until the desired width is reached, in correspondence to the upper bodice of dress. 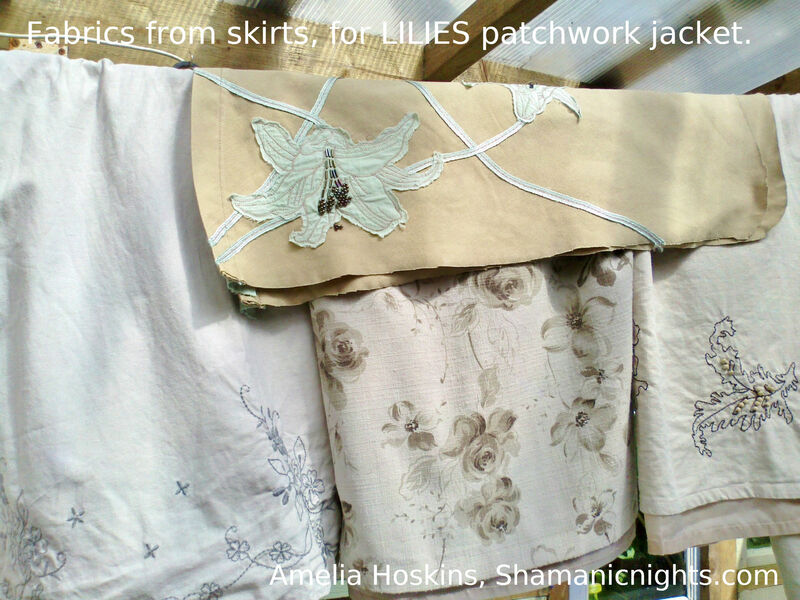 I describe an ad-hoc method of choosing fabric patches one by one, until enough are made. Alternatively, by calculating desired length of dress, and desired size of patches, you can calculate how many patches of each fabric colour or printed pattern will be needed in advance of cutting and machining. Lay them out on a table to desired colour juxtaposition, keeping in mind how the front and centre back will look. Work similarly from centre back, adding patches across and down, until length is reached. Create the patches in columns, then machine down the long rectangular panels, onto the under lining. (Fabric, or garment used as lining base). Allow 2-3 inches more at front and back, which can be gather-stitched to fit before seaming the bodice and skirt parts together. This could be darted if preferred. I darted the kimono-dress. There was enough blue themed fabric left to make small tunic dress. 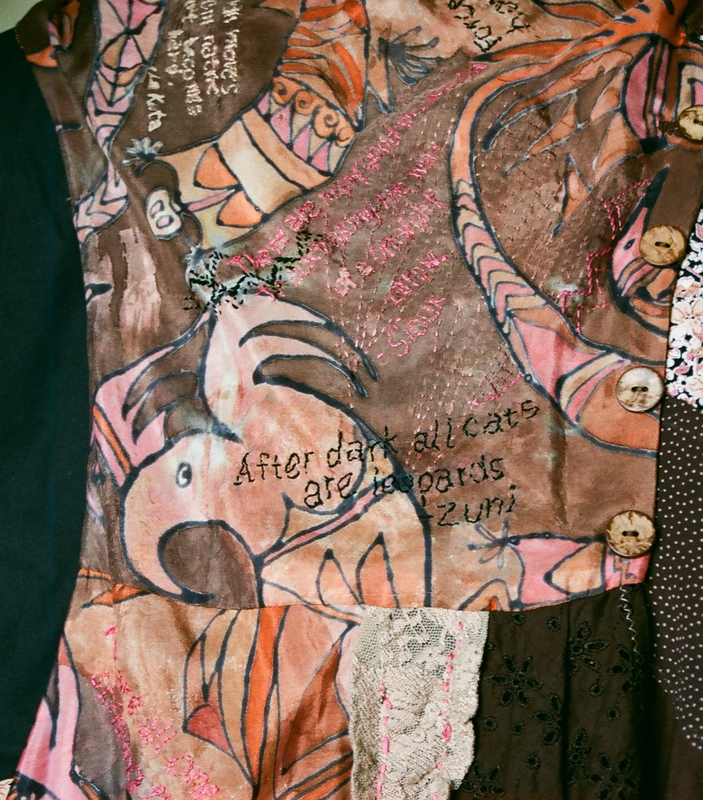 Again, patches are stitched onto an existing garment; a cream/white/brown/blue flora design A-line short sleeved flared top, which becomes the lining. The beige and blue on creamy peach work well with the blue patchworks, and also provide a light background to the blue lace patches, contrasting the lace: see top back photo and front lower side. (Light coloured lace can utilise darker backgrounds.) 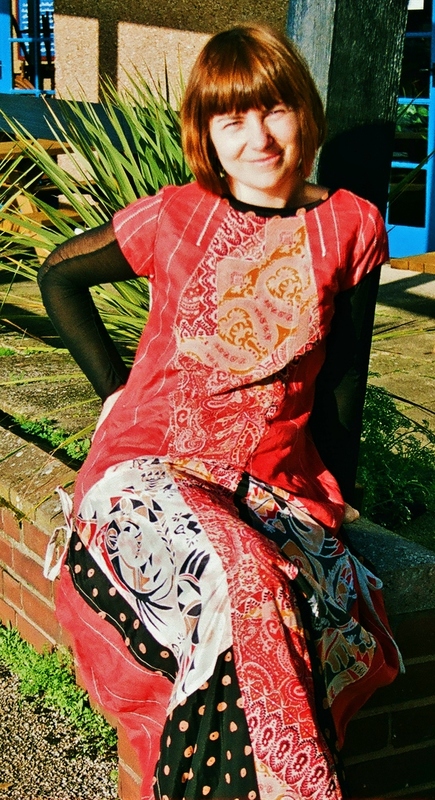 Short sleeves are unlined patchwork with bound viscose print hems. The armholes were large, for a Plus size, so I darted the lining from armhole to bust point, and did same with upper patchwork. I cut down the centre due to extra width, and folded over edges for front facing firmness, still having enough to overlap for buttoning. Mark width of button, add a little more. Sew a rectangle over button size area on right side of fabric. Fold rectangle through to wrong side, Press flat with folds meeting, as shown. Hand stitch lining to bound edges. Top stitch on right side (optional). I did so here, due to fraying of lining fabric. SILK PAINTING DESIGNS ‘Hopi Bird Dance’. Three dresses with similar silk painted design in 3 colourways. When I coordinate found fabrics to recycle together into a new look garment, I enjoy imagining a new decorative design with them; to contrast with the many plain cottons and linens I use. Hand painting designs on silk is the obvious solution, taking inspiration from the existing colours and any print coordinated with the plains. 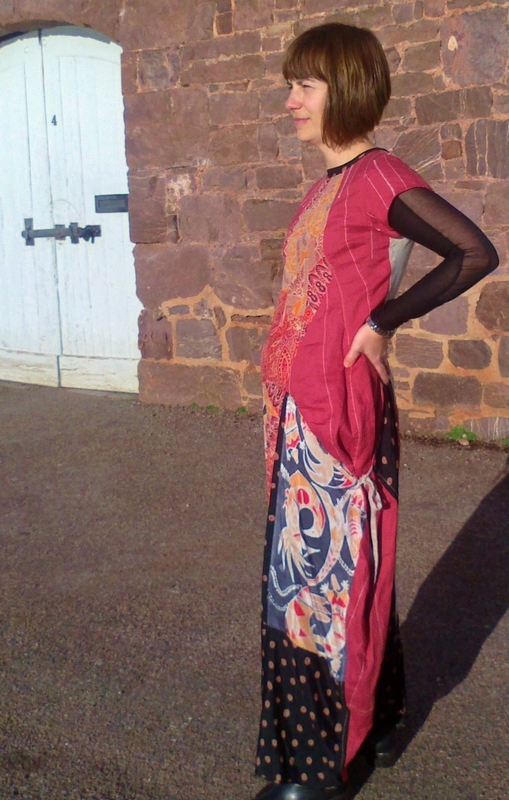 I was busting to get back to silk painting which I’d developed as a technique in my first Devon workshop back in 1995! When designing, one has to start from somewhere; taking a few elements and putting them together. I began again, exactly where I had left off, with the inspirations I’d had for the last paint on paper furnishing design I’d done. I’ve always been intrigued by Native American design and recently found images of abstract bird designs of the Hopi Indians applied to pottery. They reached a height of decorative abstraction, distorting their bird designs to fit over any curved pottery surface; a brilliant applied design. I have kept these ‘curved’ surface designs almost exactly as the originals, but applied them to a two dimensional surface of Habotai silk. It was an obvious decision to put feathers around the Hopi birds but I needed another element. I decided on a selection of Native American quotations intended to stand out in cream. However, I wrote them with a water based gutta resist, and they were mostly blurred or lost during the steam fixing process; so I embroidered over them. By happy accident this gives another texture, although time consuming. A spirit based gutta may work better next time. For the FIRST HOPI BIRD DESIGN I kept to the natural colours from the pottery inspirations; beige, orange, terracotta and brown, adding a stronger pink. 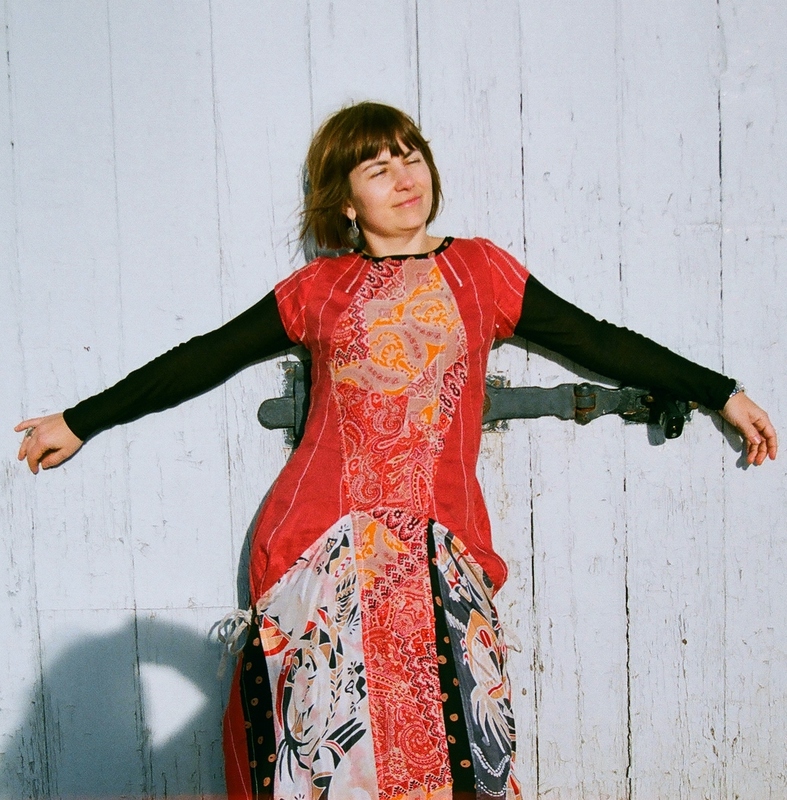 I teamed the final piece with brown cottons and viscose from recycled skirts to make an unusual but charming pinafore dress showing off the silk design in the bib top and apron.